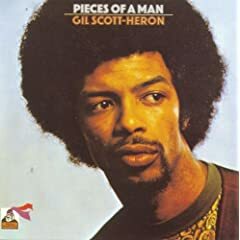 Here’s a clip of Gil Scott-Heron’s most famous spoken word piece, ‘The Revolution Will Not Be Televised’, taken from his 1971 album Pieces of a Man. Gil Scott-Heron is thought to be one of the progenitors of hip-hop, approaching his early efforts with a spoken word ‘rap’ as backed by an insistent groove, with some counterbalancing jazz flute acting as a foil to his strident vocal delivery. His was the street-level voice of a black man concerned that the larger American culture was leaving his community behind in the wake of cultural distractions. Among these distractions was television and commercialism which took attention away from what was happening in neighbourhoods in cities all over America – that the poverty cycle and disillusionment caused by it was reaching a breaking point. Where Marvin Gaye was angered and saddened by this same trend as expressed in his “Inner City Blues” put out that same year, Scott-Heron is full of disdain and sarcasm, listing off the banalities of white America measured against the anger and rising tension that stood in contrast with it. Whether or not Scott-Heron can be traced to today’s hip-hop in general is arguable, although his connection to individual hip hop artists like Grandmaster Flash (‘The Message’), The Disposal Heroes of Hiphoprisy (‘Television, The Drug of the Nation’), and Public Enemy (‘Fight the Power’) is pretty undeniable in terms of tone and subject matter. What Scott-Heron was trying to do with this piece and other early poetry pieces he’d done while working in the same vein as contemporaries the Last Poets was to shed light on what was happening in the inner cities. Hip Hop today, for the most part with those listed exceptions in mind, is about rising out of what is happening there, and escaping it. Absent from modern hip hop is the concern for the community that is so endemic to Scott-Heron’s work, it seems to me. In its place is the same banal materialism that he is speaking out against in “The Revolution Will Not Be Televised”. What do you think, good people? I’m sure there are examples which prove this generalization of mine wrong. Are there some striking examples of social commentary and concern left in modern hip hop? I’d love to be turned on, hip hop fans! Great tune. Basically, in my humble opinion, the last listenable rap tune. There have been a few since then, I think. I personally think that Outkast is a hopeful indicator. Fabulous stuff! First time I’ve ever heard him. I had heard the phrase before, but from the documentary about a failed coup attempt against Venezuela’s president Hugo Chavez. A sleeping population in front of TV sets (and now computers and video games) has been a core belief in my world view, so I think Gil Scott-Heron is bang on. Several poems in Leonard Cohen’s Flowers for Hitler discuss the drug of apathy. I like k-os too, as far as activist hip-hop. If you want to explore Scott-Heron’s work further, check out the Ghetto Style compilation. It contains a lot of his singing on it – “Lady Day & John Coltrane” being a favourite of mine. But, it also contains early versions of TRWNBT, as well as a number of other spoken word pieces. Thanks for the K-os recommendation. Any key albums? I’ve got some iTunes credits so I’m gonna get Pieces of a Man – it has “Lady Day and John Coltrane” on it (and Ghetto Style isn’t available in iTunes that I can tell). K-os – a good place to start is Joyful Rebellion; Hallelujah and Crucial are particularly good. Brilliant, Zaak. Enjoy! And thanks again for the recommedations! Well, I am a huge fan of Gil Scott-Heron, and he has clearly been a major influence on the formation of rap, but I don’t think it is right to call his music rap… And I also think there has been a lot of really listenable rap music. I myself enjoy a bit of the Wu now and then, but for people who (think they) don’t like rap, that wouldn’t be the place I would start. Try Public Enemy – in particular, perhaps, “Black Steel in the Hour of Chaos” from the album “It Takes A Nation Of Millions To Hold Us Back.” Also, Brand Nubians, Pharcyde, De La Soul, and for something very far out there, but musically superb, “Dr. Octagon” – a project by Kool Keith and Dan the Automator. Thanks a lot for comments, and for hip-hop recommendations too. I too wouldn’t call Gil Scott-Heron a ‘rap’ artist in the hip hop sense of the word. It should be mentioned that there was an older use of the word ‘rap’ around the time that this record came out as it applied to music, which today we would call ‘spoken word’. Isaac Hayes, for one, was famous for his ‘raps’ in this tradition. Like all language, the term evolved into what we know rap or rapping to be today. Here’s an interesting Wikipedia article about the history of rapping, which predates modern music entirely stretching back to folk traditions in West Africa not unlike the blues.